In today’s world of vastly overprocessed, cheap, quick foods, wholesome foods have taken a backseat. We have strayed from our natural roots, and as a consequence, our health is on the decline. However, for those who choose to eat an abundance of fresh, healthy foods, longevity is a natural byproduct. While you might not live to 100 by eating these foods, you can certainly cut your risk of developing many diseases and, therefore, live a healthier life. Avoid takeout as much as possible. Instead, cook food at home using fresh ingredients. Also, don’t cook with too much salt. Opt for fresh meat instead of packaged deli meat. Processed meats have been linked to cancer, so avoid them as much as you can. Eat plenty of fiber to improve digestion and get vital nutrients. Indulge in sweets occasionally, but try to eat mostly dark chocolate when your sweet tooth gets the best of you. Use real sugar and butter instead of the substitutes. Drink coffee, but keep alcohol to a minimum. Make sure to eat plenty of protein and keep processed carbs low. Eat only until you’re full. Spend plenty of time with friends and family. With those out there, let’s get into the foods you should eat if you want to live a long, happy, healthy life! If you want to live to 100, you definitely need to get peas into your diet. Eating cooked peas and other legumes – a huge part of the Mediterranean diet – may slow down aging of the cells, according to a study published in BMJ. Scientists believe the fiber and antioxidants present in peas gives them their anti-aging powers. According to research published in BMC Medicine, people who eat walnuts regularly (at least three times per week), will live two to three years longer, on average. Walnuts help reduce the risk of cancer and heart disease, which will certainly help you live longer. Plus, carrots contain tons of Vitamin A, which helps to protect the skin from bacteria and generate new skin cells. According to a study done by the University of Copenhagen, a diet high in healthy fats such as those found in coconuts can slow down brain aging by shielding DNA from damage. If you want to live to 100, you should seriously consider adding coconuts into your diet by cooking with coconut oil, drinking coconut milk, or simply eating fresh coconuts. Fermented foods such as sauerkraut have a lot of good bacteria that can increase your life span. The bacteria have benefits such as reducing inflammation, increasing metabolism, and boosting the immune system. According to Kansas State University researchers, eating sweet potatoes regularly could increase your chances if you hope to live to 100. They reported that sweet potatoes, especially the purple variety, contain high levels of anthocyanin, a compound that decreases cancer risk and increases longevity. A glass or two of wine per day won’t hurt you; in fact, the resveratrol in the wine – a polyphenol compound found to slow down aging and reduce cancer risk – can help you live longer. However, make sure you drink red wine, as this type of wine contains the most resveratrol. As far as chocolate, opt for dark chocolate made with little or no added sugar. Dark chocolate contains flavonoids, which have antioxidants that can help reduce inflammation and protect the skin against oxidative damage. Plus, dark chocolate can help boost cognitive function. Pomegranates might help you live to 100, or at least longer than average, according to a Swiss study. Researchers say that a molecule found in pomegranates called urolithin A can enable muscle cells to guard themselves against major causes of aging. One of the best sources of omega-3 fatty acids, salmon can help you live to the ripe old age of 100. Omega-3’s help reduce inflammation and protect against conditions such as heart disease, dementia, and arthritis. Salmon contains a high amount of astaxanthin as well, a natural pigment considered one of the best anti-aging antioxidants in the world. Blueberries taste great and are high in Vitamin C and A as well as anti-aging antioxidants such as anthocyanin. A high intake of this compound could help protect you against age-related diseases as you get older. Plus, the antioxidants found in blueberries can shield you from oxidative damage that contributes to diseases such as heart disease and cancer. 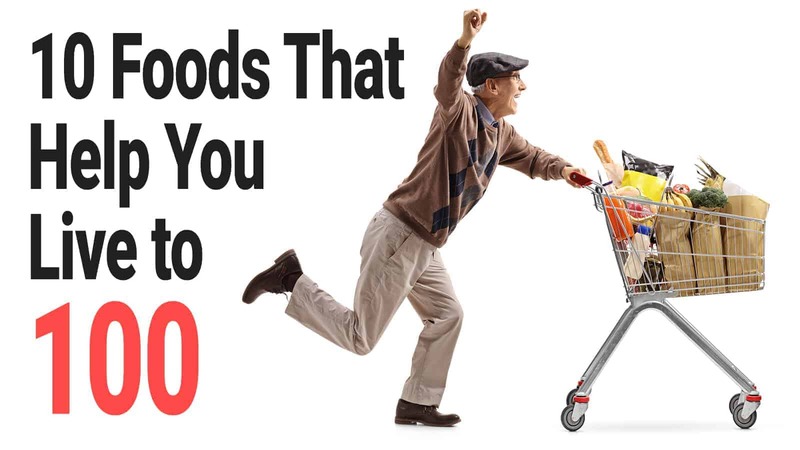 These are just a few foods that could help you live to 100, but as an added bonus, we’ll include a few more foods that should become additions to your daily diet. Spinach is low in calories and high in nutrients, which means you should eat this veggie as much as you can. This is another food high in antioxidants which can help you live longer. It’s also rich in nutrients such as Vitamin A and C, which help to keep skin healthy and generate new cells. Avocados are chock-full of healthy fats that can reduce inflammation and protect your brain from aging. They are another fruit high in Vitamin A as well, which helps to keep infections and skin problems at bay. 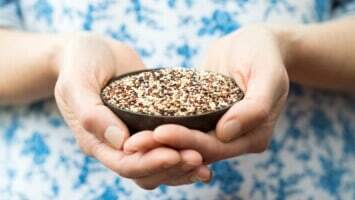 Chia seeds are a powerful anti-aging food due to the large amount of Omega-3’s present. Not to mention, they contain all nine essential amino acids and have a lot of fiber, which makes them a nutritional powerhouse. 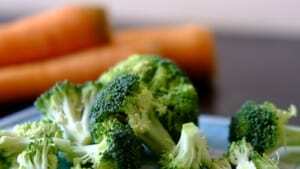 Broccoli is a cruciferous vegetable that you should include in your diet as much as possible. It contains nicotinamide mononucleotide, or NMN, which one study found improved the function of the eyes, liver, and skeletal muscles. Broccoli contains high levels of folate and fiber as well, which can help speed up digestion and protect against certain cancers. Allicin—a component in garlic—is a powerful antioxidant that can help to fight aging. To get the most out of this age-boosting food, make sure to let the garlic simmer in a pan for at least 10 minutes. This will help increase the production of allicin. Parsley is rich in vitamin C, vitamin K, and the flavonoid myricetin, which can help in preventing skin cancer. Vitamin K can reduce blood clotting, improve bone health and memory performance, reduce risk of osteoporosis, and lower blood pressure. You can use parsley in salads, pesto, soups, pasta, and even steak dishes. Hemp seeds have healthy fatty acids including omega-3s, omega-6s, gamma-linoleic acid, and stearidonic acid – all of which help protect against heart disease and promote healthy skin. They also help lower cholesterol and blood pressure, decrease inflammation, and increase metabolism. If you don’t eat salmon, hemp seeds provide a great way to get enough Omega-3s in your diet. Hemp seeds have been shown to protect the brain against neurological diseases such as Alzheimer’s, Parkinson’s, multiple sclerosis, childhood seizure disorders, and neuropathic pain. 57% percent of the fatty acids found in flaxseed oil are alpha-linoleic acids (ALAs), one of three omega-3 fatty acids. The body converts this type of fatty acid into even more powerful fatty acids such as: docosahexaenoic (DHA) and eicosapentaenoic (EPA) acids. Flaxseeds also contain large amounts of flavonoids, which help to lower bad cholesterol and blood pressure. Flavonoids also reduce the risk of cancer, asthma, stroke, and heart disease. Flaxseeds are also rich in fiber and protein, which can keep you full longer and improve digestion. Living to 100 might not just come down to food, but what you put in your body can certainly boost your chances of living a long life. We either feed disease or fight it every time we eat, so if you want to keep your body healthy and inflammation-free, make sure to eat an abundance of the foods listed above. If you want the most straightforward health advice, just eat how your grandparents did: whole, fresh foods with no added preservatives or fillers. Eat from nature and your body will reward you with lasting health, happiness, and vitality.